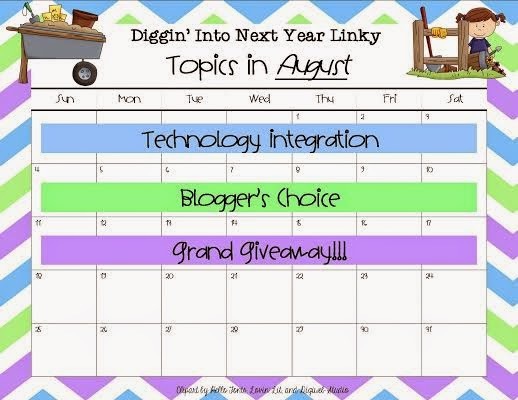 I am super excited to be participating in a weekly series of linky parties this summer, hosted by Laura at Where the Magic Happens. 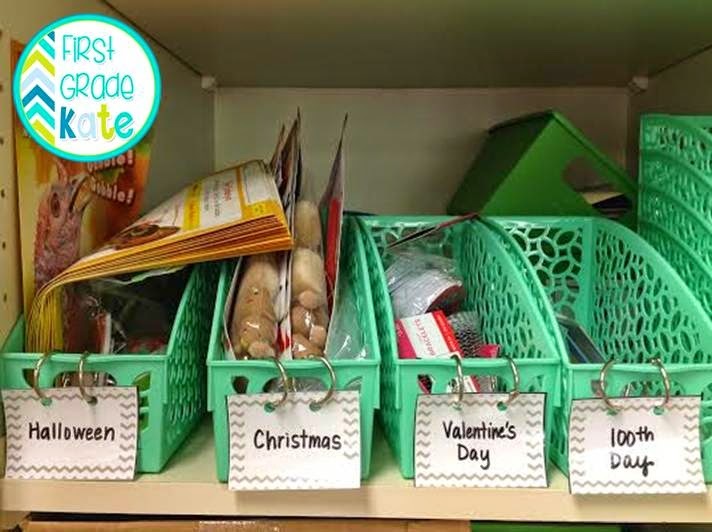 This week is a big one...classroom organization! Before we start, I have a confession to make. I am not naturally an organized person. BUT, everyone at my school *thinks* I'm organized because I work really hard to combat my naturally unorganized tendencies. So even if you are not naturally an organized person, I am here to tell you there is hope! Haha! I'll start with one of my biggest organizational challenges: my desk. There is definitely still room to grow in this area, but I have a couple things that have helped me be able to find things quickly when I need them. The first is this desktop storage carousel. I found it at Michael's and although it's a bit pricey at its original price of $45, I bought it when I had a 50% off coupon. It holds all of my writing utensils (including the festive pens students have made for me! ), scissors, thank you cards, and koosh balls (because every teacher needs a couple of those right?! ), and the bottom has 3 compartments where I hold paperclips, push pins, and binder clips. A few of the slots were a bit too deep for the markers, so I filled the bottom of those with large beads to make the markers stand a little taller in the slot. The next thing is this toolbox. My desk is nicely situated by a classroom window, so this toolbox fits nicely in the windowsill. I made it a couple summers ago when they were all the rage, and I don't regret my decision to follow the crowd. :) I don't use all of the compartments, as I found that a couple were a bit small for what I slotted them for, but it's great for holding all those other little office supplies that need a convenient, accessible home. Yep, that's a lot of dust. Take this picture for what it is: an organizational tip, not a Martha Stewart magazine photo. 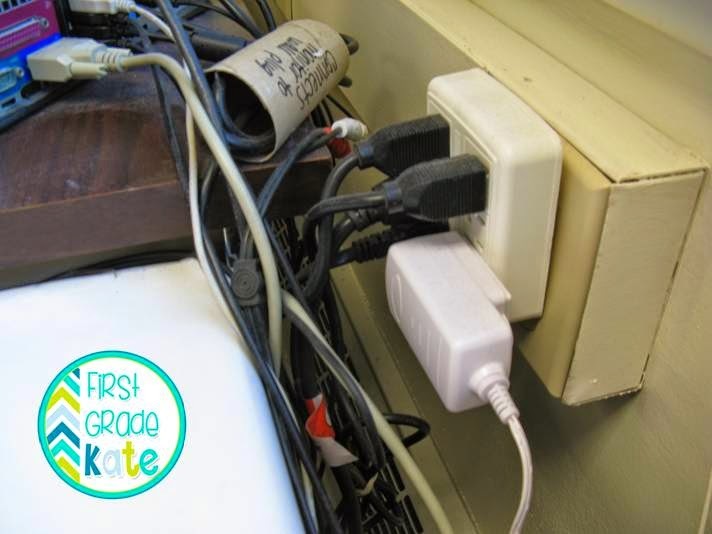 One last thing in regards to teacher desk organization...I would *highly suggest* taking a picture of all your technology cords before packing up your room for the summer. It always saves me a TON of time in the fall because I can just reference the photos and don't have to play any games of "Guess Where This Cord Goes". Keeping long cords wrapped up in cardboard tubes (labeled with what the cord is for) also cuts down on the time I spend untangling everything in August. 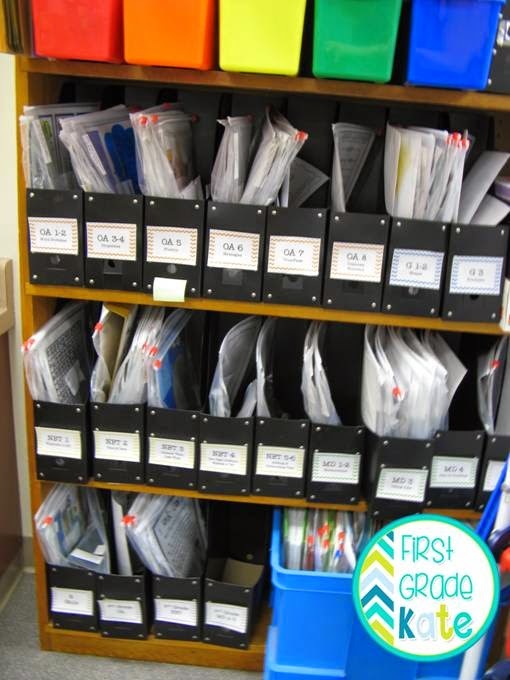 My copy bins...a convenient place to store papers until I'm ready for them. 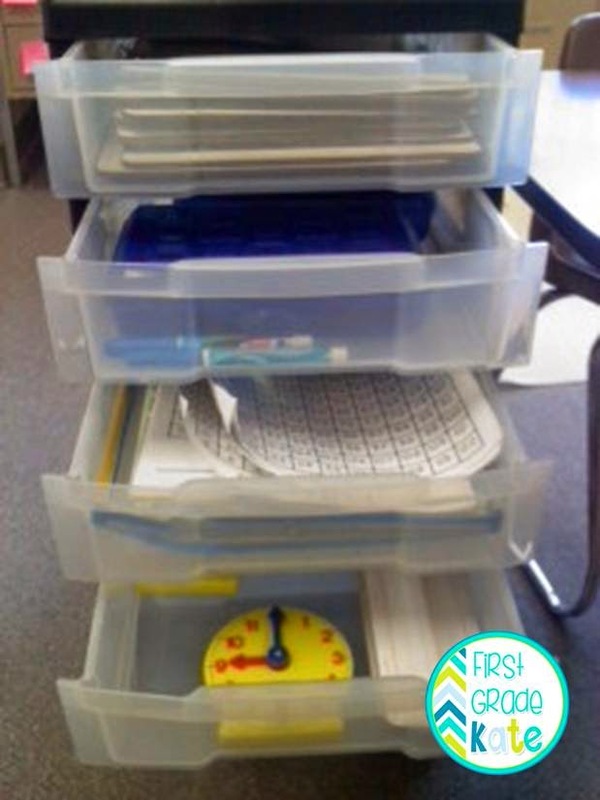 I have a rolley cart by my guided math table where I keep my most used math tools. I also have a bookshelf in my room where I store all my math games by standard. It makes it easy to quickly grab what I'm looking for! Holiday item storage has been a challenge for me, but this year I put small holiday items (pencils, erasers, crafts) in these file bins. I'm hoping I can easily just grab what I need next year. 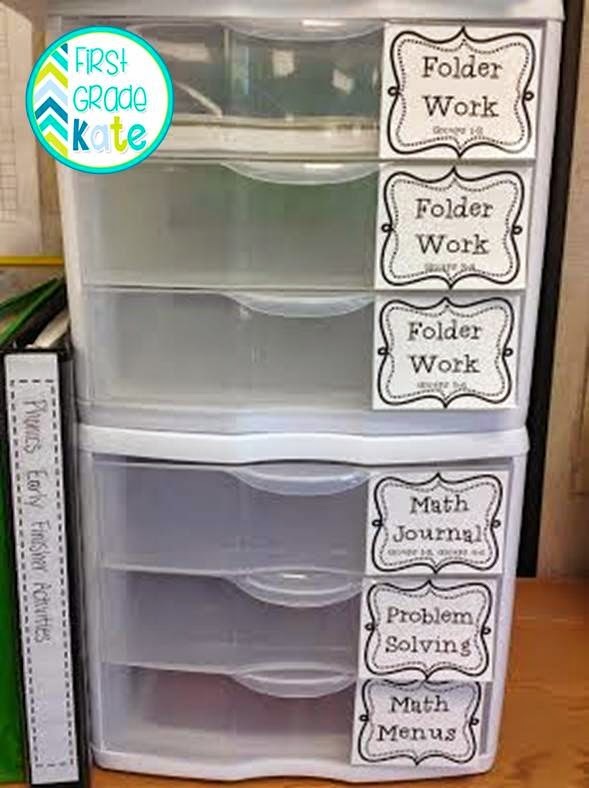 Besides the need to keep myself organized, I also try to help my students stay organized. It makes transitions go smoother and makes my life easier! I have a couple things in my room to help with this. 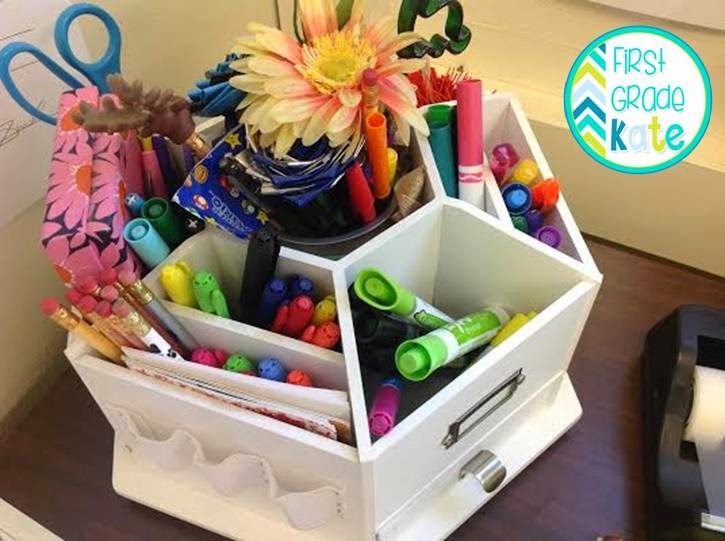 On top of each table, I keep a table caddy with the school supplies we use daily. The velcro holds student nametags, but I removed the nametags for this picture for privacy reasons. 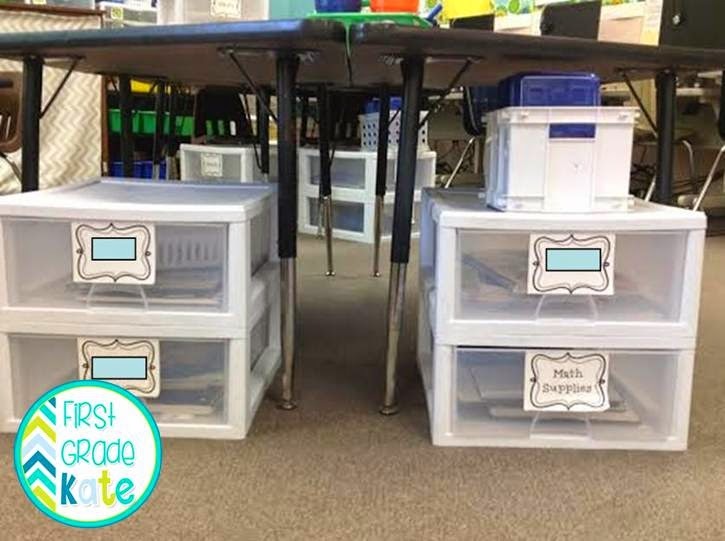 Another way that I help my students to stay organized is by using these under the table cubbies. I got them my first year of teaching through a Donor's Choose project. They have been a life saver for me, especially since I see over 60 students a day! (My school specializes K-5, so I teach math to all 3 first grade classes.) At each table is a cubby for each class (labeled with the homeroom teacher's name- blocked out in this photo), and this is where my students keep their math notebooks. 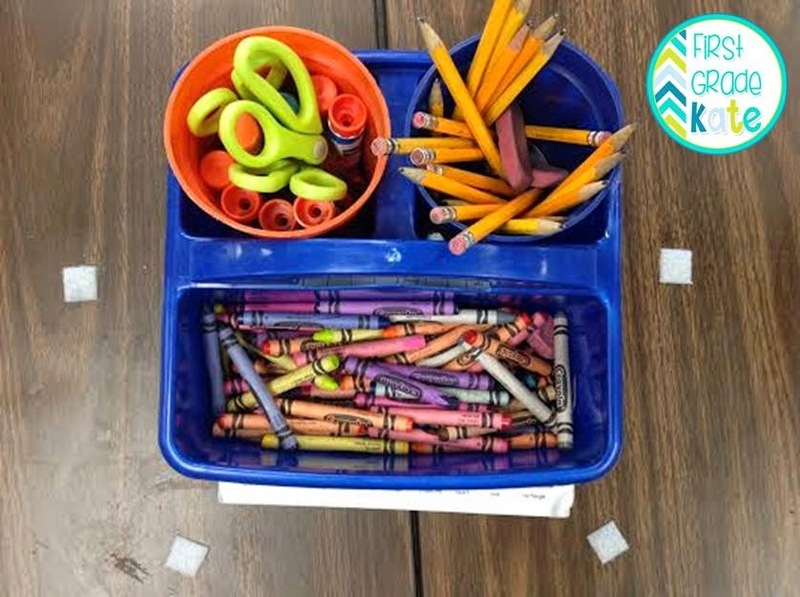 The fourth drawer is labeled "Math Supplies", and that is where I keep whiteboards and some of our most used math tools so each table has some handy for when they need to quick grab something to help them figure out a problem. 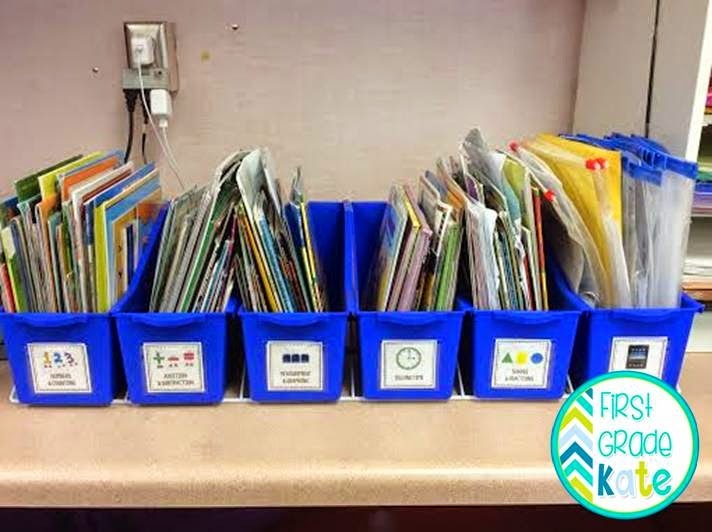 Math books are sorted by topic and kept in these bins from Lakeshore. (Donated thanks to another Donor's Choose Project!) Get the labels FREE at the end of the post! 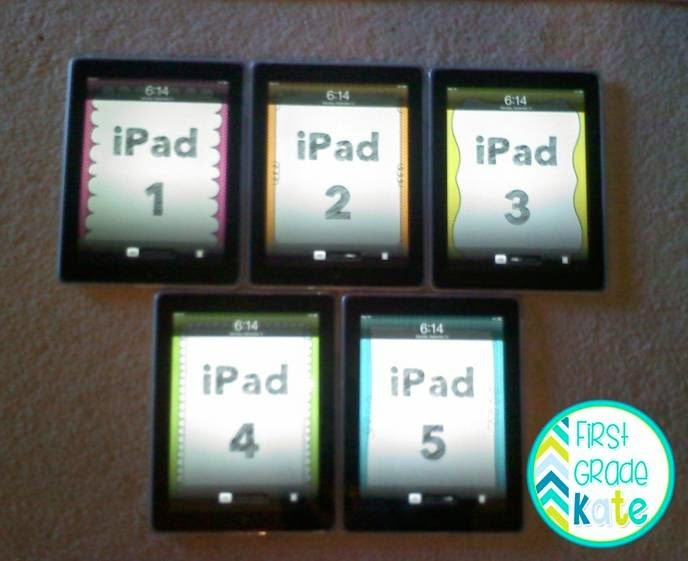 Putting numbered backgrounds in my class iPads helps me keep track of them! The backgrounds are a FREEBIE below! 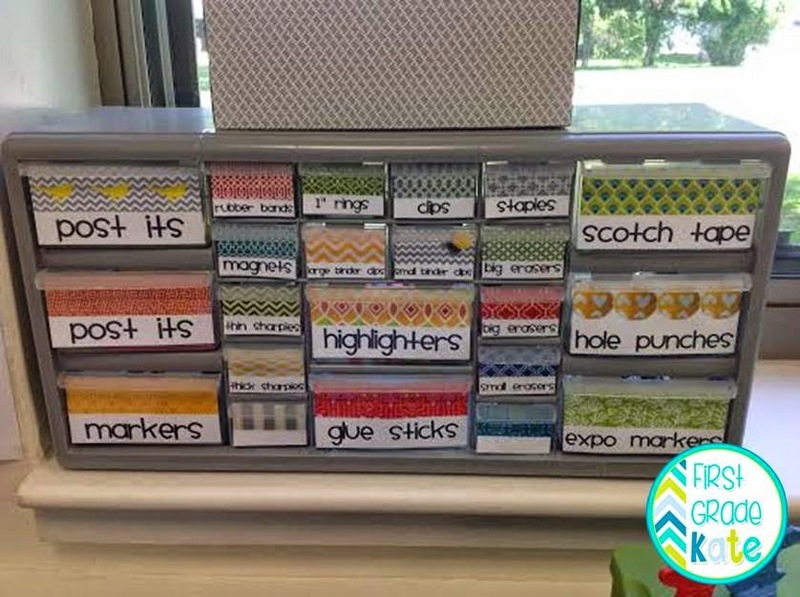 Thanks for taking a peek at how I organize my classroom! 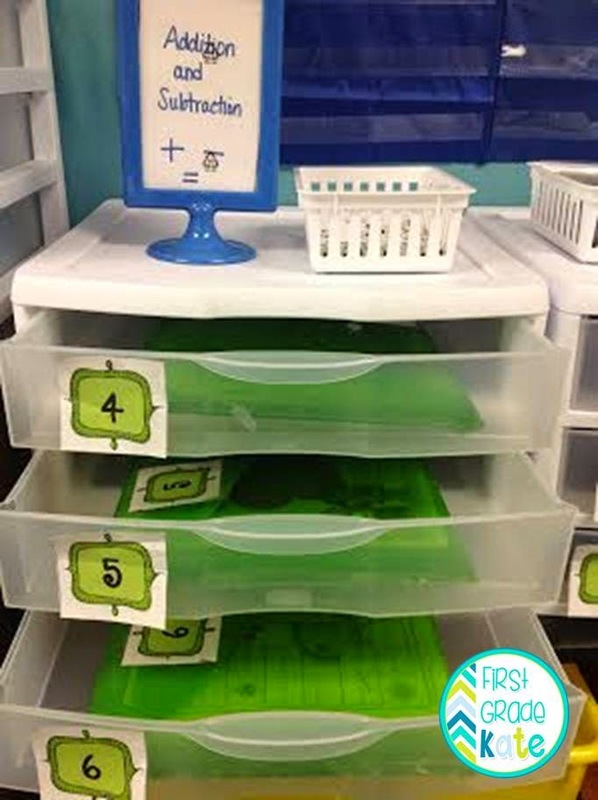 I always love to look at other classrooms for ideas, so I hope these pictures have been helpful! So far, these tips have worked pretty well for me, but of course there's always rooms to improve! If there's an organizational tip that you love, please pass it my way via the comments section! 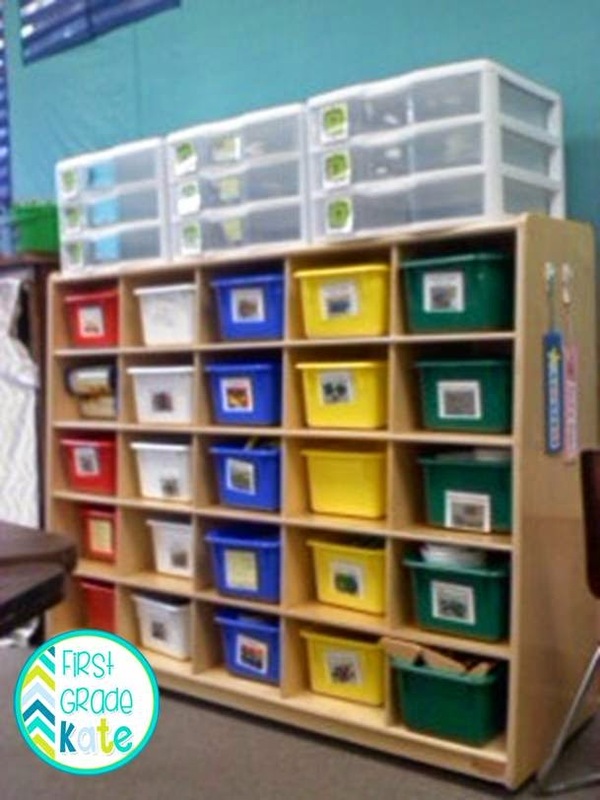 You can also view more Classroom Organization goodness by checking out the other blogs in Laura's linky! Katy...you are another Wisconsin Blogger. We are far and few between. I love your blog...I just happened upon it tonight. Mrs. Laffin's Laughings and I are meeting this summer in Oshkosh as well as Teaching in the Little Apple. We would love for you to join us. It's so nice to find other WI bloggers! You are right that there doesn't seem to be very many of us. I have not met anyone from the blogging world in person. I would love to join you! Keep me updated on where and when!! Katy, I too am not a naturally organized person! I was that kid in school who's desk was immaculate, but room at home was a hot mess! Anyway, your tips are really great! Love taking a picture of cords to eliminate the guessing game! YES! That was (and still is) totally me as well! You do NOT want to see my apartment! LOL! I was wondering if you had the labels for your toolbox available? I absolutely love them! Thanks so much! Unfortunately, I can't share them because most of the photos are not for commercial use (from stores, etsy shops, etc). It was before I started my TPT store, so I never thought to get commercial use pictures. Sorry!